Reading progress update: I've read 10 out of 233 pages. Switching between this and Veiled by Karina Halle because I didn't realize I couldn't get the latter on my usual reading device I use during work downtime (my original Nook Color), so that will have to wait until I can be on my phone or laptop back home. The rest is TBD, depending on how I feel and what I find when I get to those squares. 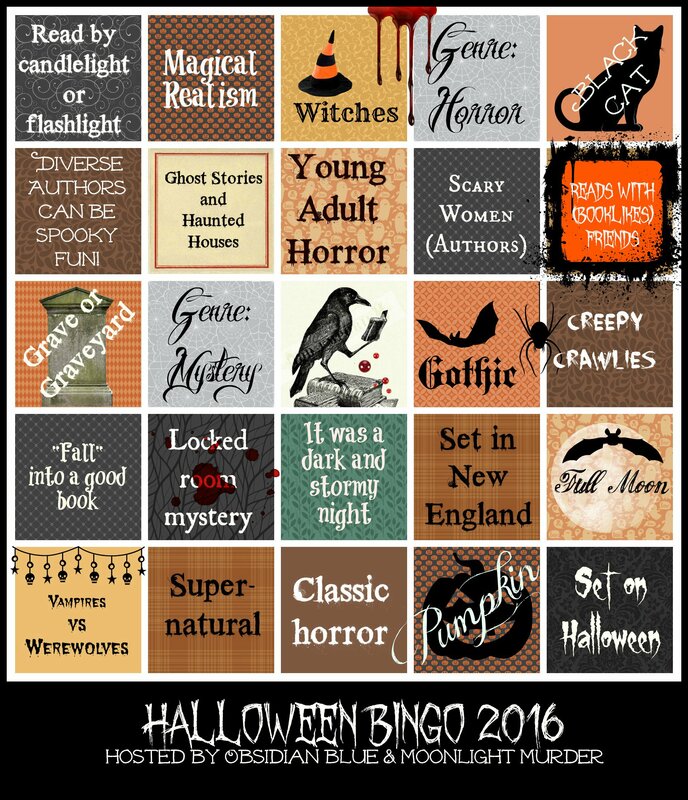 Well we are less than a day away from starting Booklikes Halloween Bingo 2016! 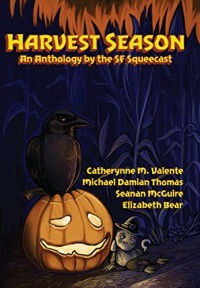 Moonlight Reader (Murder) and I are so happy to see so many people excited about the Halloween Bingo. I love how everyone is trying to help each other out with finding books that can complete a square. I think we mentioned the rules here and there for how we were planning on doing this bingo, but we thought it be good to have it all spelled out before the bingo kicks off tomorrow. Start Date of Bingo: September 1, 2016. That means that a review posted to fit the bingo has to occur after September 1, 2016. I know that means some of us are going to be reading the night before (yeah I am, I can hardly wait to dive into my books). End of Bingo: October 31, 2016. So please make sure that you have your bingo card all filled out so we can include your name for the drawings. 1. If you are going to be participating in the bingo, please add a comment down below. That way Moonlight Murder and I can follow you on Booklikes. Also follow each other! That way you can see what other people are reading, just in case you get stuck trying to find a book that will fit a bingo square. 2. We are going to be using "Halloween Bingo 2016" as the tag for the bingo contest. That way you can use the tag to follow other Booklikers who are also participating in the contest. 3. Only one book counts towards a bingo square. The middle square (Raven reading a book) we decided does need a book to fill it otherwise some people will be able to get a bingo after just reading four books. We want it to be fair for everyone. So we decided that the free space you can read any book in there that you want as long as it is related to Halloween in some way. 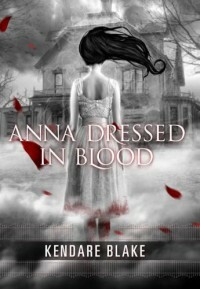 It doesn't have to be horror, it doesn't have to be young adult. Heck I just noticed some children's books that would fit in nicely. 4. You can get a bingo by reading five books across or down. You can get a bingo by going diagonally as well. I saw some people saying that they thought you could get a bingo by just reading the four corner squares, but for the purposes of our bingo, that doesn't count. You would need to do four corners and the middle square in order to bingo (5 books). 5. You do not need to black out the whole card to participate in the bingo contest. If you do though, you can join in for the blackout contest. 6. Each bingo that you get is good for one entry in the contest with a maximum of five entries per person. We plan on having drawings for the bingo every other Thursday. That means we are going to have drawings on 9/15, 9/29, 10/3, & 10/27. We will have a final drawing for blackouts only on 10/31. We plan on having a total of five drawings. 7. Once you win, you are out of the bingo drawing. That way we can make sure that everyone reasonably has a chance to win. 8. For the blackout drawing we are still deciding if we are going to include prior winners or not. It really depends on how many people are going to play to get the blackout bingo card. 9. Moonlight and I are obviously participating, but we are not playing to win. 10. If you have any questions concerning a book that you think should count towards a bingo square or just general questions, feel free to comment here, or message us on Booklikes or in the group discussion Booklikes Bookish Bingo Club. 11. Re-reads absolutely do count. I know a lot of people wanted to read new books for the bingo, and that is fine, but it is not a rule. 12. There is the second annual Dewey Readathon on October 22, 2016. Moonlight and I participated last year and had a blast. We want to remind other readers about it so that way in case you find yourself behind, you can always set aside some time to participate in the readathon as well as do the bingo at the same time. 13. Have fun! I hope no one is going to stress too much over this. I loved the Summer Bingo because it was just fun to read books and see how they would fit with the bingo. I actually did not plan for that square at all and still managed to find a ton of books that I really enjoyed (except Alphas because that book still haunts me to this day). See below for the bingo card! Rarely has there been a book that made me both scared to go to sleep in the dark and made me love the horrors in it so much. Fantastic. 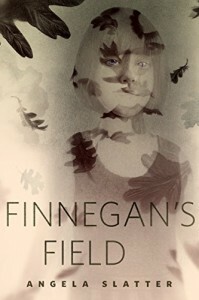 Wonderful short read, if you enjoy horror and some heartbreak. The writing sucked me right in, and I really felt for Anne and her daughter right through to the end.